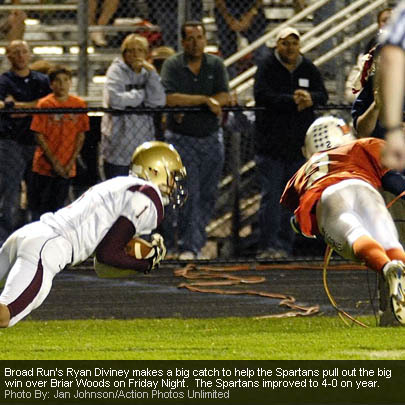 BRAMBLETON, VA - The Broad Run Spartans traveled to Brambleton to play the Briar Wood Falcons in the first ever Varsity meeting of the two teams. Both teams entered into their inaugural District game undefeated as both teams stood 3-0. Stands were packed and fans encircled the field as the excitement was electrifying the air from weeks of anticipation on the oncoming battle. A sports fan of any type could have not asked for a more exciting venue with one of the largest crowds, two primed football squads, and the harvest moon rising above the stadium to set the mood to what was soon to be the "Brawl In Brambleton". The Spartans drew first blood as they drove the length of the field behind the power running of Billy Rocca and Kenny McAdow, and the slashing style of Breon Earl, putting the Spartan's up early 7-0. The Spartan's again drove deep into Falcon territory following an interception of an Alex Munro pass by Sophomore Joey Quigg. The Spartan's were stopped at the Falcon 8 yard line in a momentum swinging defensive stand. On the ensuing possession the Falcons drove the length of the field and scored on a 12 yard pass from Munro to WR Tim King. Following a successful 2 point conversion, the Falcons were now ahead 8-7. The Spartans drove deep into Falcon territory late in the first half but were turned back as Devin Barber intercepted a pass at the Falcon 10 yard line. At the end of the first half, the Falcons led the Spartans 8-7. The second half of play started with the Spartans driving into Falcon territory on a series of runs and play action passes. Following penalties, miscues and two excellent run stops by the Falcons, the Spartans punted the ball to the Briar Wood 22 yard line. The Falcons were unable to move the ball and on the 4th down, Broad Run Junior Mikey Cotton, blew through the interior of the Falcon line and blocked Max Rassman's punt. On a mad scramble for the ball, the Spartans Rocca recovered the ball in the end zone putting the Spartans a head 13-8. The Falcons did not fold, but rather gave the Spartans a taste of their own medicine as they switched to a power running game and behind the running of Andrew Davidson and Billy McDonald, drove to the Spartan 15 yard line. A quick strike from Munro to King gave the duo their second touch down of the night and put the Falcons back on top 15-13. With the home team crowd in a frenzy, the Falcons stuffed the Spartan running game and put the Spartans into a 3rd and long situation. Shain then found a slanting Flemming for the first down and followed up with a 52 yard bomb to Flemming again, giving the Spartan's a first and goal from the Falcon 2 yard line. Eric Madigan scored on the ensuing play and on the PAT giving the Spartans a 21-15 lead going into the 4th quarter. The Falcon and Spartans defenses both came alive in the 4th quarter denying both offensive powers any foothold throughout the early goings of the quarter. With the Spartans on the Falcon 48 yard line, a fake punt pass from Chris Jessop to Tommy Meier covered 21 yards giving the Spartans a first down on the 27 yard line. The Spartan's went back to the ground game running the ball down to the Falcon 4 yard line and giving them a first and goal. The Falcons defense again met the challenge, stopping the Spartans for consecutive losses. Following an unsportsmanlike conduct penalty, the Spartans were now 3rd and goal from the 21 yard line, when Jessop found Ryan Diviney at the 2 foot line giving the Spartans a 4th and goal just inches from pay dirt. On 4th down play, the Spartan's Jessop ran a quarterback sneak and had apparently scored by signal of the linesman. The back judge over ruled the touchdown saying that Jessop was assisted into the end zone on the play. The Falcons now had the ball at their 1 yard line with 3 minutes and 16 seconds left in the game. On first down, Munro found King for a 13 yard gain. Munro was then sacked by Senior Dustin Locasico. Munro came right back completing passes to King and Nico Darden giving the Falcons a first down at their 35 yard line. Munro then hit Jeremy Gray for an 11 yard gain. 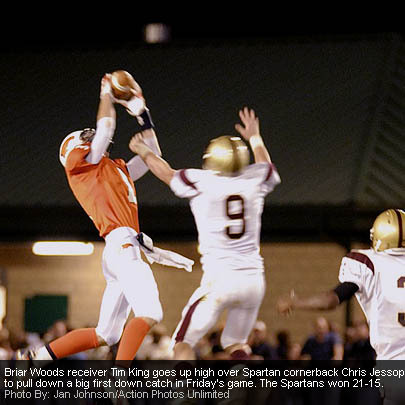 With 30 seconds left in the game, a deep pass from Munro to King was intercepted by Jessop at the Spartan 31 yard line sealing the victory for the Spartans. Next week, the Spartan's play host to the Heritage Pride and the Falcons hope to gain back their winning ways as they travel to the Dominion Titans.